Stores Ref. 27P/7. Approx. 11 x 8.5 x 2.6cm. Gilt metal box - similar in size/shape to an old tobacco tin. Printed with Air Ministry King's crown and reference details on the lid and with contents list to the base. Originally held Barley Sugar sweets, Chewing Gum, Malted Milk Tablets and Energy Tablets. The inside of the lid is printed with instructions for use. The tin has minor surface corrosion and small dents but is in good to very good overall condition and all text is legible. The rubber lid seal is also in tact. Faint 1/44 date. 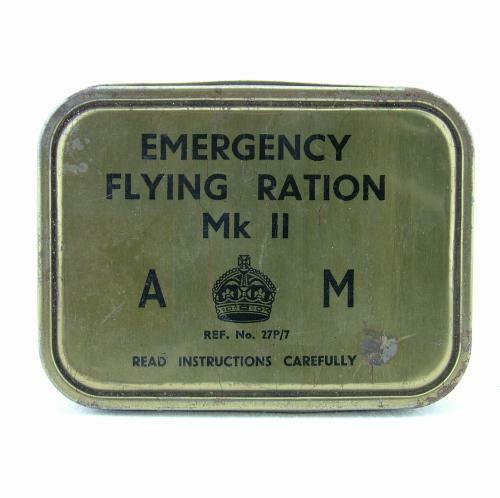 These rations were officially issued as part of the dinghy survival kit but saw wider distribution in survival packs etc. Empty. Stock code S18207.